Can the Corp place the advancement tokens from the ability on Jemison Astronautics onto multiple cards? No, all the advancement tokens must be placed on the same card. If the Corp, playing as Jemison Astronautics, forfeits Hostile Takeover hosting Political Graffiti, how many advancement tokens do they place on a card? The Corp places 1 advancement token on a card, 1 for the ability and no additional tokens because the Hostile Takeover was worth 0 agenda points when it was forfeited. 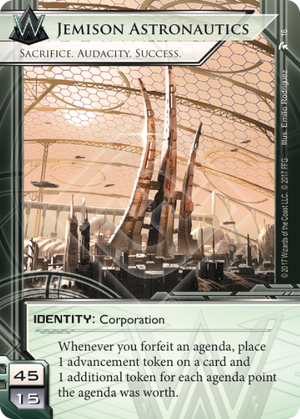 If the Corp forfeits a card that becomes an agenda, such as "Clones are not People", how many advancement tokens can Jemison place on a card? The Corp places 2 advancement tokens on the card, 1 for the ability and an additional 1 for the agenda point “Clones are Not People” was worth. An interesting identity. It seems designed to offer a different way to gain agenda points: by trading up. Normally you score an agenda for 1 point, then another for 3, then another for 2, etc. You score an agenda and then start anew on the next agenda. At Jemison they do things differently. You forfeit one agenda and get agenda points plus one back as counters. On the face of it that sounds like a terrible deal, a 5/3 agenda gives back 4 in counters. But there's method to this madness. Consider that your score area is the safest place agenda's can be, only Turntable can get in there. If you can score an agenda in one turn and somehow trade it for another in the next turn you don't have a runner's turn where there's a server with a big neon sign "agenda's here" over it. The question is though, can Jemison Astronautics deliver on this vision? The answer is a resounding yes. Assume that at the start of a turn you have a (4/2) scored and a (5/3) on hand. You install the 5/3 (1), forfeit the 4/2 to place 2+1 = 3 counters on the 5/3, advance the 5/3 (2), advance the 5/3 again (3) and score. False Lead can be triggered to forfeit. However it will cycle soon and I'm not sure you can use it on the corp's turn since it cannot have an effect (could be wrong there, the rules on that are subtle). Posted Bounty can be forfeited when scored. However that's usually not the moment you want to place those advancement counters. Archer triggers a forfeit when rezzed. But this this usually during the runner's turn so you have to install an agenda in the previous corp turn. Ibrahim Salem triggers a forfeit when rezzed. It costs 3 influence though unless you meet the alliance conditions. Corporate Town is probably the best of the classic options. It triggers a forfeit when rezzed and has a useful effect (trash one resource every turn). At 5 it's at the very least sure to get the runner to spend some resources to get rid of it. Oberth Protocol triggers a forfeit when rezzed and helps with advancing by giving you one extra advancement token each turn you advance a card. Quarantine System can trigger a forfeit whenever you want it, provided you have an ICE to rez. It also helps with defense by letting you rez ICE cheaply. Quarantine System is key here. It's what lets you forfeit ICE without spending a click. If you can get Oberth Protocol that's nice but unless you're going to turn a Hostile Takeover into a Vanity Project you don't need it if you have Quarantine System and a turn to spend. This identity has its downsides though. Not in the deck and influence limits, those are standard enough, but decks using Jemison are going to be highly reliant on its ability being available. That means of course that Employee Strike is a critical threat. Luckily there are good and cheap currents available to dispel an Employee Strike such as Paywall Implementation, Enforced Curfew (makes Şifr hurt more) and Cerebral Static for some what-goes-around-comes-around. Another threat is that runners trash Quarantine System. Certainly at first runners will often not realize the importance of this card since it's rather underwhelming at first glance, but it won't take them long to figure out your game. All in all Jemison Astronautics is an identity for people who want to play a fairly standard form of Netrunner in a slightly different way. It shows that on Mars even a walls and punishment behemoth like Weyland can learn new tricks.